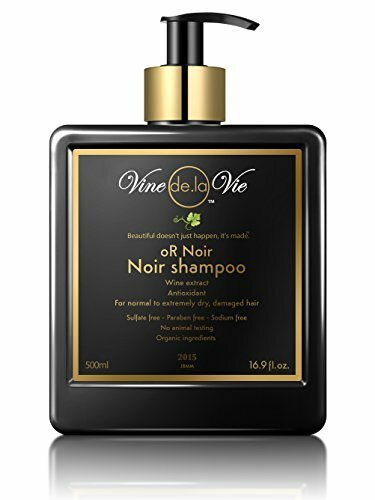 Vine de la Vie oR Noir Shampoo, Organic-Based - Wine Extract Antioxidants, Use on Wet or Dry Hair - 16.9 fl. oz. Product prices and availability are accurate as of 2019-04-17 02:41:57 UTC and are subject to change. Any price and availability information displayed on http://www.amazon.com/ at the time of purchase will apply to the purchase of this product. NATURE'S BEST: Our products are made with all-natural and organic-based ingredients. The secret is "The Wine Extract" a water-based polyphenol that neutralizes free radicals and stops oxidation. SCIENCE BASED BEAUTY: Our ingredients form a high-performance formula including Vitamin B1, B3, B6, B12, E, C, and A, which help combat aging, cellular destruction, and breakdown of healthy cells. NOURISH YOUR HAIR AND SCALP: Our premium organic ingredients completely penetrate the hair follicles and scalp to leave behind healthier, shinier, more radiant hair with enhanced volume and color. IMMEDIATE/INSTANT RESULTS: Vine de la Vie products, especially when used unison, work with any hair type, whether fine, normal, or extremely damaged and show noticeable results after just a few uses. PRODUCT DETAILS: Vine de la Vie oR Noir Shampoo contains wine extracts, antioxidants, and is free of sulfates, parabens, and sodium, and is not tested on animals. 16.9 fl. oz. (500ml) bottle.